Heritage Family EyeCare | Optometrist Keller TX > Blog > Allergies > Why Do Animal Allergies Cause Eye Irritation? Why Do Animal Allergies Cause Eye Irritation? Eye irritation due to allergies, also known as allergic conjunctivitis or ocular allergies, is a common problem for allergy sufferers. One cause of allergic conjunctivitis that plagues many people is pet dander. Itchy, watery, red eyes after contact with an animal or after entering a room where an animal normally lives could be due to animal allergies. Almost 62% of households have pets and about 10% of all people have animal allergies, so a significant number or people are affected. In addition, the NIH found that detectable levels of pet dander could be found in every home. Allergies are caused by your body’s immune system deciding that a harmless substance is an allergen, which in turn eventually causes the production of antibodies called IgE, since your body is attacking the allergen as though it were a virus or bacteria. The IgE antibodies are responsible for the resulting allergic reaction. Ocular allergies are when something that you are allergic to irritates part of the eye known as the conjunctiva. As a result your eyes water, itch, hurt, or become red and swollen. The increased tear production can, in turn, cause a runny nose. The allergic response is coordinated by mast cells, which are found in many different tissues and are part of the immune system. When the immune system produces IgE it binds to receptors on these mast cells, which in turn release histamine. When the histamine is released from the mast cells it binds to receptors on nerve endings and causes the symptom of itchy eyes. It also binds to receptors in the conjunctiva of the eyes and causes redness (due to vasoldilation.) On top of all of that, immune system cells are recruited and result in increased sensitivity. Pet dander is a common cause of animal allergies, but people can also be allergic to saliva, or urine. 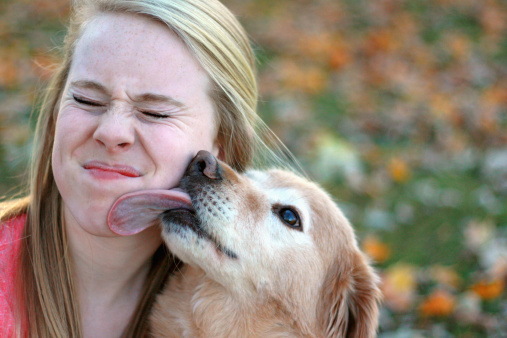 Your body actually reacts to the proteins in these pet substances. Cats are more common to spread allergies in their saliva since they groom their fur regularly. Mice and rats can also spread dried saliva from grooming, but their urine can be a source of eye irritation when their bedding is cleaned. Allergies to dogs can be due to the dander, urine, or saliva, but may also be due to pollen, dust, or mold that the dogs brings in from outside. Pollen is one of the most common allergens and might be mistaken as dog allergies in certain cases. Contrary to popular belief, the animal hairs themselves are not usually an allergen, but can carry pollen, dust, mold, or other allergens. Short-haired animals do not cause fewer problems and there really are no true “hypoallergenic breeds,” but some breeds may cause a lower reaction. Some studies suggest that female cats have lower allergen levels than males, and neutered males have lower levels than intact males. Other studies regarding pet color (light fur vs. dark fur) appear to be inconclusive. Visiting homes of people that have pets can cause eye irritation, so if you are staying the night you may request that the homeowner keep the pet out of the room you will be sleeping in for a few weeks. Animal dander can be carried on people’s clothes or luggage, so be aware that even if the pet isn’t around the allergens can be. If you are allergic to your pet bird both the feathers and droppings can be allergens. Feather pillows or down comforters are not recommended for people with this type of allergy. If you have significant allergies to your pet it may need to be removed from your home, but there are options for people with minor allergies that wish to keep their family member. If you are allergic it may help to keep your pet out of your bedroom and avoid hugging, kissing, or petting your cat or dog. You can also try limiting which rooms your pet is allowed to be in, but due to central air you may need to use a central air cleaner to avoid blowing the allergens throughout your house. If you have a cat be sure to place the litter box in an area unconnected to your central air or away from the vents. Antihistamines help to stabilize the mast cells and non-steroidal anti-inflammatory drugs (NSAIDs) can help with your symptoms. For mild symptoms a cold compress may help. Avoiding touching your face and proper eye hygiene can go a long way in preventing eye irritation due to animal allergies, especially for those with contact lenses. Eye irritation due to animal allergies may be a common problem, but there are many options out there to relieve your symptoms. Controlling the symptoms or controlling the immune response are just two or the many methods to relieve your itchy, watery, red eyes without having to rehome Fluffy or Spot.